When I studied Latin in high school, one of the things that used to bug me was the way that the name of the Roman poet Publius Vergilius Maro was Anglicized as "Virgil." That never made any sense to me, since the poet's nomen quite clearly did not have an "e" in its first syllable. Yet, pretty much every English language book I could find, including my Latin text books, spelled the name with an "i." I eventually asked one of my teachers why this was so and he explained to me that, in the Middle Ages, many people used The Aeneid as a divinatory text, randomly choosing passages from it to predict the future. In doing so, they sometimes used a little stick or wand to point to a passage, the name of the stick in Latin being virga. This led to a false association between the poet's name and the divinatory wand, hence the shift from an "e" to an "i" in the English spelling. As I eventually discovered, Vergil was renowned for many amazing feats in the Middle Ages, not least of which being his prophecies (he was reputed to have predicted the birth of Christ in his Eclogues, for example). He could turn men to stone, immobilize entire armies, and conjure up entire rivers out of nothingness. 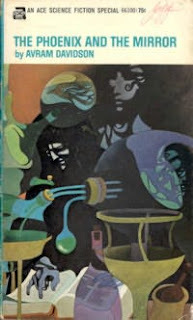 Needless to say I found such medieval tales fascinating and so it was with great pleasure that I stumbled across Avram Davidson's "Vergil Magus" series, the first book of which was The Phoenix and the Mirror, first published in 1966. The first novel involves Vergil's quest to create a speculum majorum, a "virgin mirror" that enables its possessor to view whatever he most desires to see. The speculum can only be fashioned from incredibly rare materials, which takes Vergil all over the Mediterranean world to acquire them for his employer, Cornelia of Carsus. The novel takes on a vaguely picaresque form, since Vergil has a knack for getting himself into trouble. At the same time, Davidson uses Vergil's travels as an opportunity to show off both his knowledge of Roman times generally and ancient occult practices more specifically. It's a terrific tour of both the real geography of the Roman Empire and the mental landscape of those times. I found The Pheonix and the Mirror very inspirational when I was in high school and, even now, it's a book I find very powerful. Davidson was a very talented and overlooked writer. It's rare that anyone discusses his works nowadays, which is a shame. His characters are not the most deeply drawn, but he excelled at describing the world they inhabit. I've been taking a few pages from Davidson in my Dwimmermount campaign, with the Thulians having a fair bit in common with the magical Romans of the "Vergil Magus" series of novels. If you can find a copy, I recommend them highly. James, you've got great taste in reading material! I too, found this book very influential in my youth, and adulthood. The very rich presentation of Vergil's world made me appreciate the importance of effective, descriptive language when trying to present a campaign world to players. BTW, the North Texas RPGCon was great, everyone is hoping you can make the next one. No pressure! Yeah I picked this up a couple of years ago. I enjoyed it but it didn't really blow me away (maybe it needs a re-read). I liked the depiction of Roman times warped through a mediaeval lens and anything with Manticores is fine by me : ) I'd love to find more of his books. Might need to add this to my list of things to look for at Half-priced Books. Course I do plan to steal some of these ideas and use Virgil as an "Occult Poet" in my Ghosts of Albion games. I read this in my late twenties and loved the detail of the esoterica. Alchemy, manticores, and the fabled brass head, if I remember correctly. But also a must read as an example of how you can take real history and include myth and magic to make an interesting campaign. you guys know about used book metasearch, right? I'm not shilling: I have no stake in the site, but I've used it many times. I read first read this book in the mid '70s, when I was about 12 or 13, and it's coloured my views on how magic item creation should be handled for as long as I've been roleplaying (I can't abide the lazy short-cutting of the latter editions of D&D, especially D&D3 and later). I've never seen any others of the series though; I'd like to get my hands on them.